Rudolph had a bit of a heavy night last night. His one beer quickly became seven and from then on, things became a bit ‘hazy’. He should’ve known that just one drop of the stuff would be enough to lure him back. A mere sniff whips him into a frenzy, but he just couldn’t help himself. The last thing he remembered was chatting to a pretty young blonde in the Beer Lodge. Her skin was immaculate, it was so shiny (almost like plastic) and her eyes were so bright they had stars (painted) in them. Her personality wasn’t brilliant, a bit fake, but he put this down to nerves and his stunning good looks rendering her near speechless. They chatted about life, how miserable his pension scheme was from Santa and the weather (always an ice breaker, especially somewhere chilly like Lapland…sorry, terrible joke). 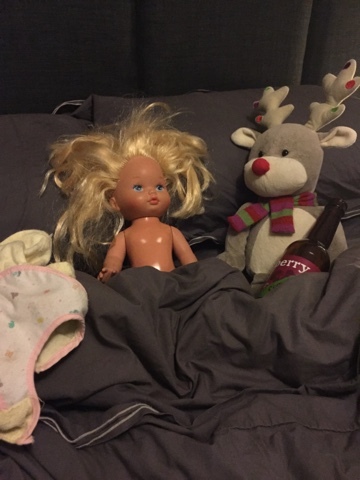 One thing must have led to another and Rudolph found himself this morning waking with a huge ache in his antlers in his super king bed…and a blonde next to him with bedraggled hair. “I don’t think we played Scrabble last night…” Rudolph said.